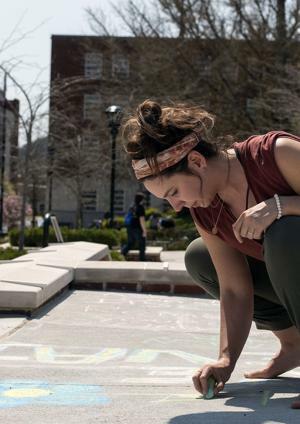 Allison Williamson, the Victim’s Services Coordinator at Pathway, joined students in this colorful sidewalk display on Wednesday, April 10, 2019, in Morehead, Ky. Some students and past victims shared similar sentiments. The event brought tears of joy due to the overflow of encouragement that was displayed by the student body. In fact, Katie Dutoit, a freshman music education major, said she wished they had these types of events at her middle school. “You never know what little girl or little boy is out there, who doesn’t understand what is happening to them is wrong or that they are being hurt,” said Dutoit. Pathways has events planned every Wednesday, weather permitting in order to continue to spread these positive messages throughout the month. The next event, “These Hands Don’t Hurt,” is centered around physical violence. In an environment where people are affected by a number of important issues, MSU Dance Ensemble is addressing these issues in a creative, kinetic and powerful way. For its annual dance concert, MSU Dance will present “Viewpoints Redefined.” The show takes place at 7:30 p.m. April 17 through April 20 at the Button Auditorium. Tickets are $11, $6 for seniors and non-MSU students, and free to MSU students with student ID. Recommended for ages 14 and older.